When we wrote about our friend Eisen’s remarkable 28 month remission from osteosarcoma, we were surprised to learn that Amazon carries many of the homeopathic remedies that Dr. Loops recommended for him. Here are some of the remedies that have helped Eisen keep bone cancer away for over two years. Please remember were are not veterinarians and this is not to be taken as medical advice. Always discuss any supplements you wish to use with your veterinary professional. Many of these supplements were also in Jerry’s Diet Plan. When a dog’s appetite lags, yummy food like this is sure to please! As usual, Amazon delivers what they promise; the biggest selection of everything on the planet. 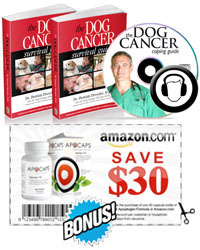 From cancer fighting supplements to premium dog food, shopping at Amazon means savings for you. Amazon is an answer for LOTS of things. Those who use GoodShop to help organizations or charities of their choice can also have a percentage of their purchases “donated” by Amazon. I have heard that there might be something to kelp for dogs with cancer, though keep in mind that I didn’t hear it from a vet, just from a pet store co-owner who said his partner’s dog improved a lot on it. I think the theory was that it was slowing tumor growth. But I don’t know the type of cancer or other details. Might be worth researching though. I haven’t seen kelp discussed on the forums (though I miss plenty), so I thought it might be worth mentioning for people to find out more about. Here’s where you can get entire homeopathic remedy kits for reduced pricing. It gives a little “cheat sheet” for uses. It’s a great kit to have in your first aid kit too…. Thanks for sharing the link Gina. But members should please remember that purchases made through the links provided in the post help support our continuing efforts to maintain the Tripawds community. @gerrysmom Thanks for the feedback. It may be anecdotal evidence, but Kelp was also a part of Jerry’s canine cancer diet and supplements, and he survived osteosarcoma for nearly two years. @Leslie We appreciate your input!